The NHS is having a bit of a crisis in the UK, struggling to look after an increasingly frail, elderly population. This week we admitted Agnes. When I saw her name in the casenotes I knew she was going to be elderly. Some names popular in the 1920s have become fashionable again, such as Daisy, Sophie and Amy. Not so for Agnes. She is 93 and was just about managing at home on her own. She has diet-controlled diabetes and recently had a hip replacement. 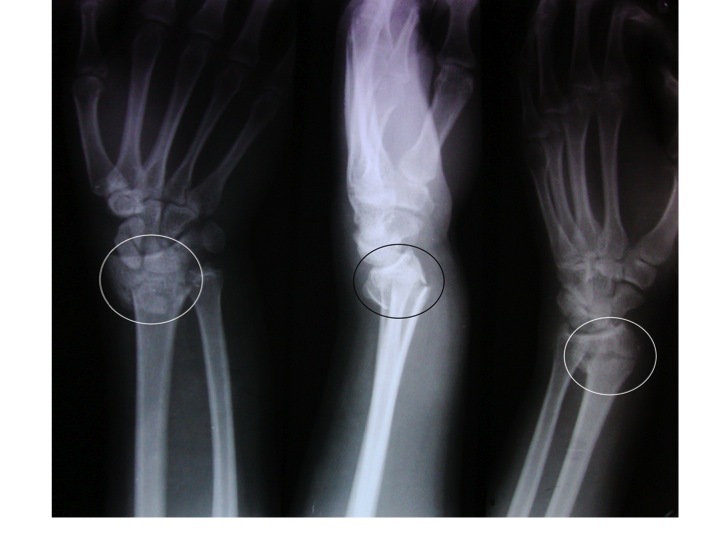 She slipped when getting out of the bath and fell on her outstretched hand, breaking her right wrist. The alarm she normally keeps around her neck was on the shelf over the bathroom sink. She did not have the strength to get up and nobody heard her calls for help. Agnes lay on the floor for more than a day without food or water. Eventually her three-times-a-week carer called and found her and called the ambulance. She was already a bit happier when she arrived in the emergency deparment after she had been given some fluids and pain relief by the ambulance crew. She was very sore down one side of her body with obvious large bruises over her buttocks, thighs and arms. The emergency department doctors and nurses had fixed her wrist and put it in a plaster. Her blood results were worrying. Her creatinine level was raised to over double the normal value for her age, and much higher than it had been after her hip operation 3 months ago. Her creatine kinase level was over 20,000, the normal being below 150. We were worried because muscle damage can cause severe kidney damage. We knew she had a lot of muscle damage because her creatine kinase level was so raised. Creatine kinase is an enzyme which is vital for normal muscle function. Kinase means an enzyme which adds a phosphate group to creatine. Creatine and creatine phosphate are small molecules which are found in large amounts in muscle – what does creatine do? Muscles need energy to work. This is supplied by mitochondria which use glucose and other energy sources such as fats and protein. If you throw sugar or fat on a fire it will burn rapidly and provide heat. Mitochondria “burn” energy sources by eventually combining them with oxygen in a much more controlled way. Instead of producing heat, the energy is converted into a chemical bond. Adenosine di-phosphate (ADP) is converted into ATP – adenosine triphosphate. Addition of this extra phosphate is rather like pulling the bowstring on a crossbow. The energy is ready to use to fire the bolt when needed. The energy stored in ATP is in the chemical bond of the third phosphate group. This energy-containing ATP can then be used by the cell to make muscles contract or perform a whole host of housekeeping functions such as making cholesterol (see previous post). Muscle needs lots of ATP, so muscle cells have lots of mitochondria. The problem is that ATP does not store well. That’s where creatine phosphate comes in handy. It stores well and can rapidly regenerate ATP from ADP. Creatine phosphate is sold in health food shops. There is some evidence eating it can improve exercise performance by increasing creatine in muscles. 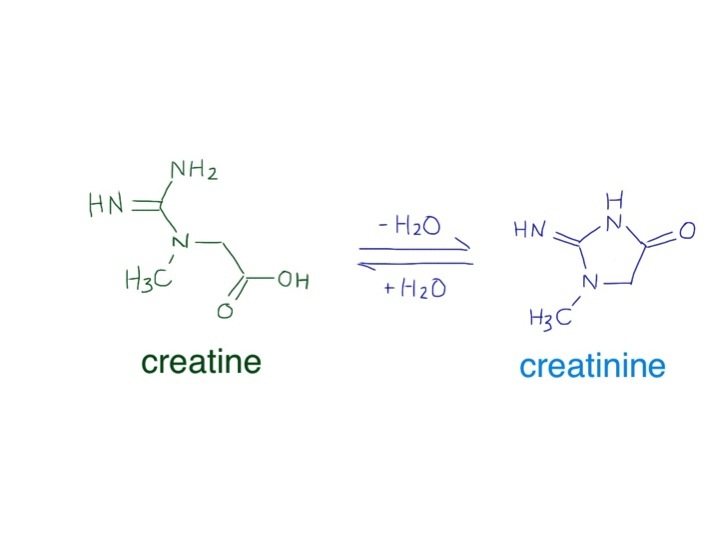 Creatine is spontaneously converted to a similar molecule, creatinine. This is produced in similar amounts in all of us every day, depending how much muscle we have got, and excreted unchanged by the kidneys. So why is the small molecule creatinine excreted in kidneys, but molecules we want to keep are not? Kidneys work in a strange way. When we want to get rid of unwanted rubbish in our houses we find the things we don’t want and put them in the bin and take them out to be collected by the waste disposal team. Kidneys do it differently. They do the equivalent of taking all the contents of our house (not large things like furniture) and putting them in the garden. Then they find all the things they want to keep – such as water, sodium, potassium, small proteins and hydrogen ions, and take them back in the house. Doctors talk about kidneys filtering fluid in the kidney. What they really mean is that blood is sieved, like when you put boiled bones, onions and carrots through a sieve to make stock. The kidney is not one big sieve, but instead it does the sieving using about a million mini-sieves. 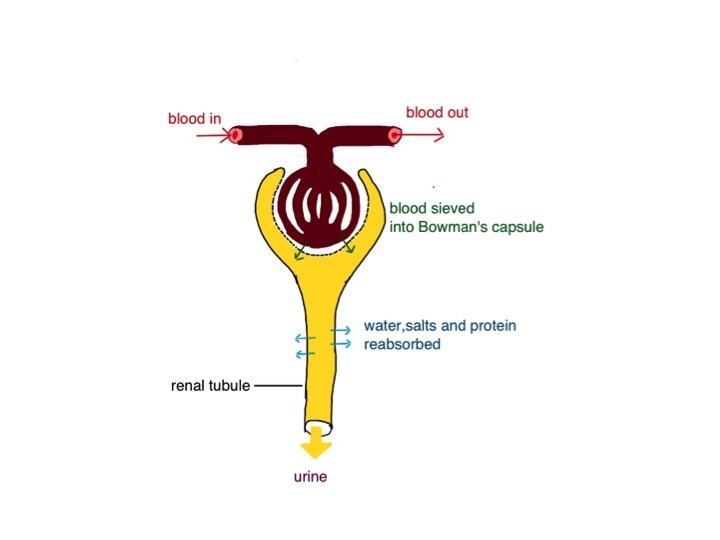 This happens in tiny structures called glomeruli where the pressure of arterial blood forces water and small molecules through the sieve into the Bowman’s capsule (see diagram). The sieve has very small holes which do not allow red cells, white cells, platelets or most protein to pass through (that’s the furniture). Eighty millilitre per minute is a lot of fluid. Nearly 5 litres every hour. Clearly we can’t afford to lose that volume of fluid so all the water is reabsorbed in the renal tubules (see diagram). The sieved fluid goes along a long tube lined with cells whose job it is to pull the water and vital salts back into our body. It might appear to be a daft system but (a) it works and (b) has the advantage that any new or foreign substance will be eliminated by the kidney if it can pass through the glomerular sieve. It means we don’t have to be able to recognise a chemical to dispose of it – The kidney tubular cells just say – “I need that – we’ll bring that back in”. Our house could do with a system like that. So why have Agnes’s kidneys stopped working? The problem is that she has damaged a lot of muscles by lying on the floor and the protein myoglobin has leaked out of the muscles into her bloodstream and stuck in her kidney tubules where it causes damage. Some muscle has lots of myoglobin – it is what makes meat red. When people talk about a bloody steak, it’s not blood which makes the meat red and drip red fluid, it is myoglobin. Myoglobin is like haemoglobin. Its function is to help drag oxygen out of the bloodstream, where it is attached to the haemoglobin of red cells, and deliver it to the mitochondria. It is very similar chemically to haemoglobin- it has a haem group attached to a protein (heme for US readers). Haem is very useful, it is a chemical structure containing iron which keeps this reactive element under control. Like a rotweiller on a leash. Haemoglobin and myoglobin are both bright red, not only due to the iron, but mainly due to the porphyrin rings which make up haem. For iron to work in haemoglobin and myoglobin it must be in the reduced, ferrous or Fe2+ form. It wants to be oxidised to the Fe3+. Myoglobin with iron in the Fe3+ is known as metmyoglobin, but is kept reduced Fe2+ in red cells and muscle cells by enzymes especially designed for that purpose (metmyoglobin reductase). Myoglobin is a very small compared with most proteins. It is smaller than the holes in the sieves in the kidney. When muscle is damaged myoglobin leaks into the circulation. Small amounts are bound by another larger protein called haptoglobin. When all the haptoglobin is used up free myoglobin goes through the kidney sieve. Other small proteins do this and are rescued back into the body by the renal tubular cells. The problem is that the iron in myoglobin, when it escapes from muscle cells is rapidly oxidised to metmyoglobin. The Fe3+ then displays its unrestrained rotweiller tendencies – it starts to cause damage. 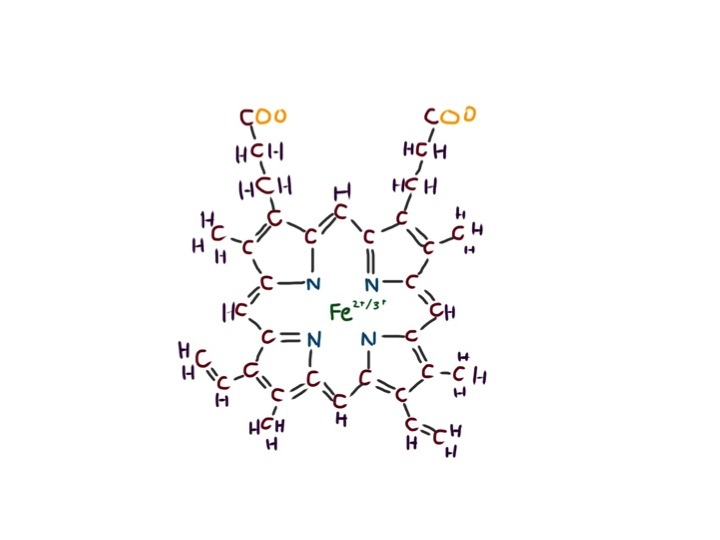 Elemental iron engages in Fenton reactions which generate free radicals. Because Hilda’s kidney tubules contain a lot of metmyoglobin, her urine is a dirty brown colour – an important clue that muscle damage, also known as rhabdomyolysis, may be part of the problem. We treated her with intravenous fluids and her kidneys recovered over the next 4 days. She went to stay with her 95 year old sister Phyllis because she could not manage with only one arm working. She was not looking forward to it – Phyllis still treated Agnes like a irritating little sister after all these years. 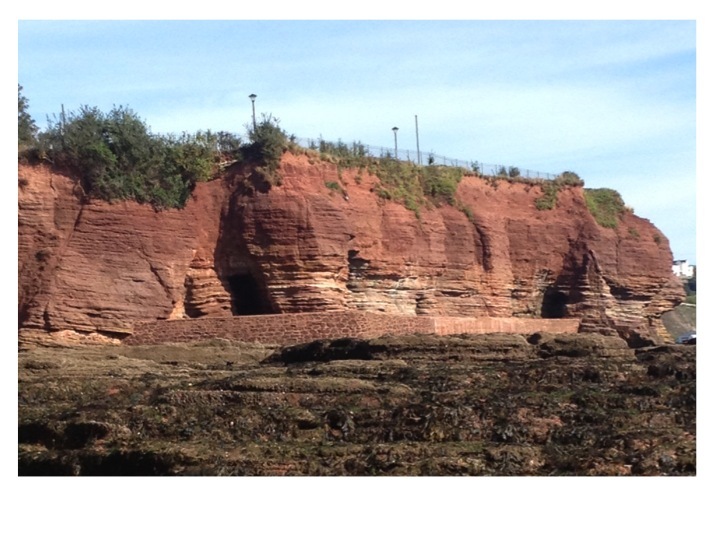 I am writing this on a train travelling through Devon in the UK. 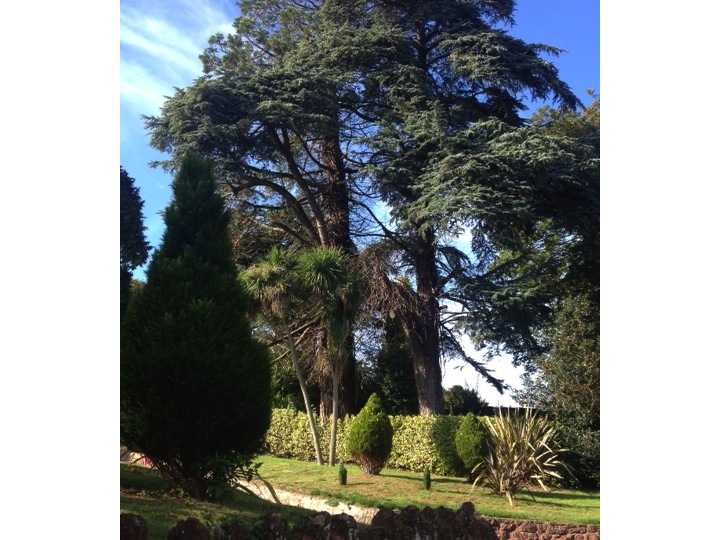 The soil is a wonderful red-brown colour, covered with bright green trees and grass. The soil is red because it has lots of iron in it. Much of the iron in our soil was deposited there in the “great oxygenation event” (not, as you might think at the 02 arena). This happened about 2.5 billion years ago. Before this the atmosphere contained no oxygen –it was mainly nitrogen, methane and carbon dioxide. The primitive organisms – anaerobic bacteria, are killed by oxygen. Then came along cyanobacteria which contain chlorophyll. Bright green chlorophyll is a remarkable molecule which is able to convert carbon dioxide and water to the very useful molecule glucose. A side product of this chemistry is the formation of oxygen. 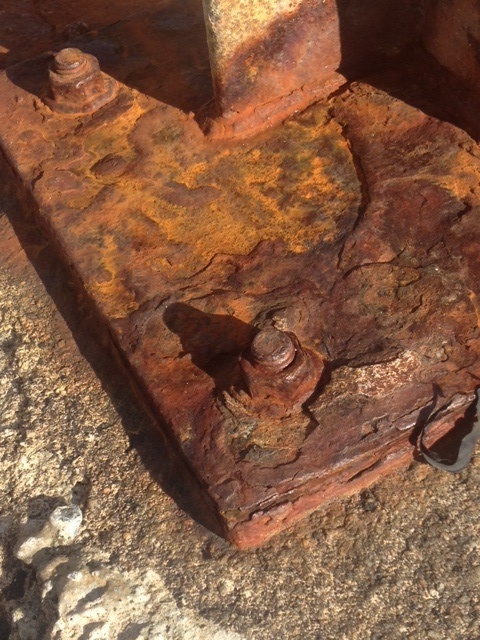 This oxygen oxidised all the iron in the oceans from green Fe2+ to the rusty-coloured Fe3+ which is less soluble and precipitated to make our soil red. When all the iron was oxidised, oxygen appeared for the first time in our atmosphere, and is still being maintained by plants containing chlorophyll. The structure of chlorophyll is really quite similar to haem. 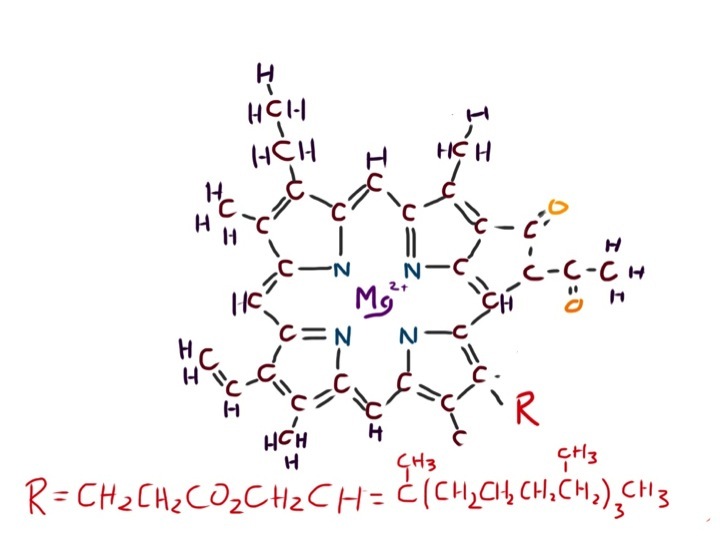 It has a porphyrin ring, but incorporates a magnesium atom instead of iron. If you boil your vegetables for too long the magnesium falls out into the cooking water and your greens turn muddy yellowish-gray. Victorian cooks would put a copper penny in their cooking water – copper replaces the magnesium and keeps the greens green. 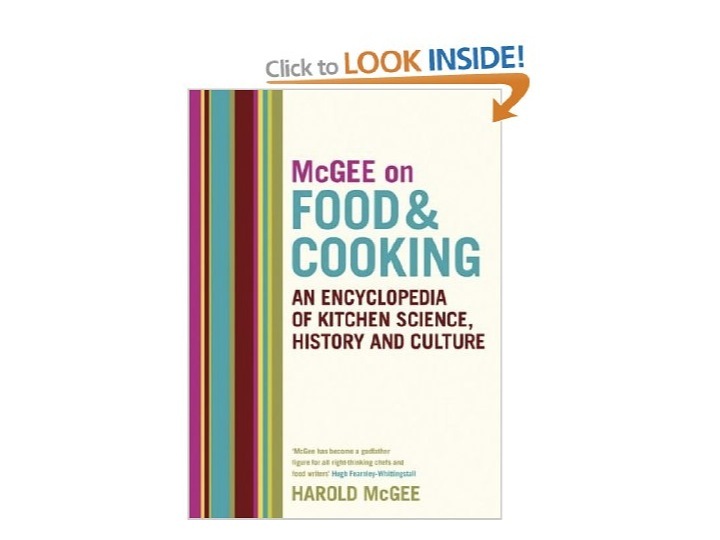 Don’t try this at home, but do read Harold McGee’s book “On food and cooking”. It tells you everything you ever wanted to know about the science of cooking and is totally readable if are interested in how the world works. Finally the food link – salami. 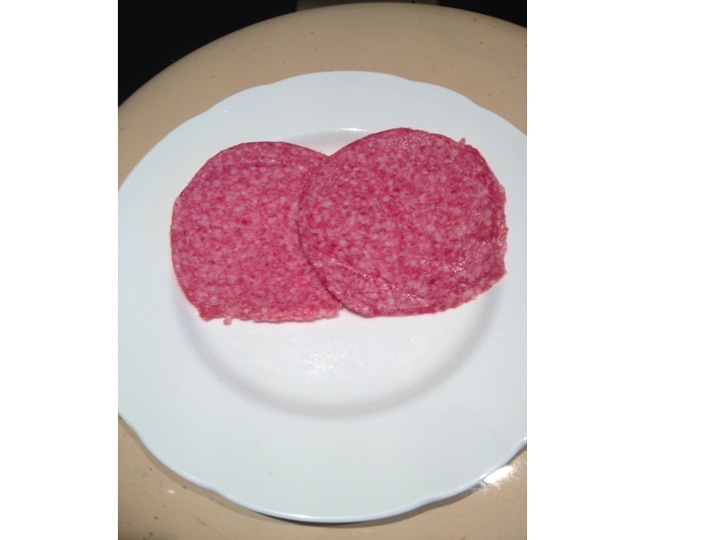 Salami is usually pink. This is because it is preserved with nitrite. Salami can be made with all sorts of meat, including donkey. 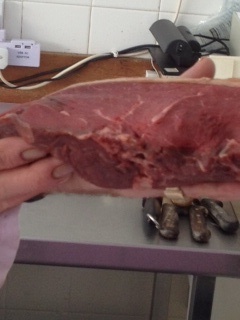 Without nitrite the meat would turn brown when minced due to methaemoglobin formation as explained above. Nitrite reacts with acids in the meat to form nitric oxide which combines strongly with myoglobin to form nitrosomyoglobin. Nitrosomyoglobin is bright pink, which is why salami, corned beef, bacon, ham are that colour and do not discolour with storage. Nitric oxide is also a useful stuff for killing nasty anaerobic bacteria which can cause serious disease such as botulism. Clostridium botulinum is a germ which forms spores that will hatch and grow in the anaerobic (oxygen poor) atmosphere in corned beef cans, and make botulinum toxin – also known as botox. Botox is arguably harmless when injected in tiny amounts into the face of rich, vain women, but very bad when swallowed in large amounts to cause paralysis of all our body muscles leading in death from respiratory failure. The main reason nitrite is still allowed in preserved meat products is that it can prevent botulism.